No fewer than 10 people died in an accident that occurred on Kaduna-Kano Expressway on Saturday. 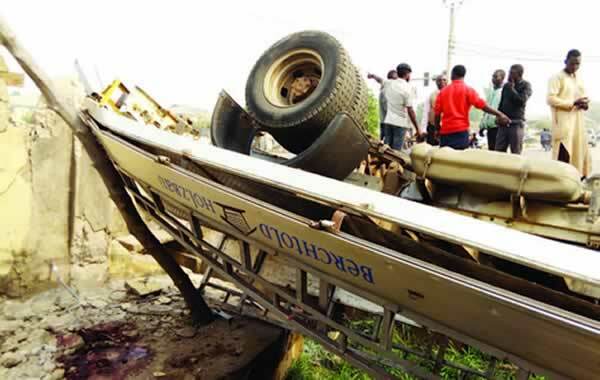 The News agency of Nigeria reports that the accident occurred around Nuhu Bamalli Polytechnic, Zaria, at 5:30 am. A statement issued by the Head of Public Enlightenment, Zaria Unit Command of the Federal Road Safety Commission, Mr Idris Yahaya, confirmed the occurrence. Yahaya said in the statement that the Unit Commander, Zaria, Assistant Corps Commander, Muktar Zubairu, described the accident as “pathetic. “The accident involved three vehicles, a luxury bus; marked GDD 361 YE, a car; marked SGR 57 XA and an articulated vehicle; marked LND 246 XE. “There are 48 persons in the three vehicles; nine people got burnt to death, while one other woman died in the hospital, 31 persons were injured while seven persons survived the accident. The unit commander said that the injured persons were also receiving treatment at the hospital, while the bodies of the dead had been deposited at the same hospital. Zubairu called on drivers traveling long distances to exhibit the habit of stretching their legs by stopping and walking around for a while after four hours of journey. “When a driver covers a distance of three to four hours, he should stop, relax and stretch his legs to clear the fatigue and carry on with the journey later. “Drivers should also drive with care, especially in this rainy season; they should ensure that their tyres are good enough for a long journey; and driving with smooth and fairly-used tyres is very dangerous,’’ he advised the drivers.